Remains of the ritual pool of Shiloah, dated to the second temple period, were recently revealed. John 9 11: "A man that is called Jesus made clay, and anointed mine eyes, and said unto me, Go to the pool of Siloam, and wash: and I went and washed, and I received sight". 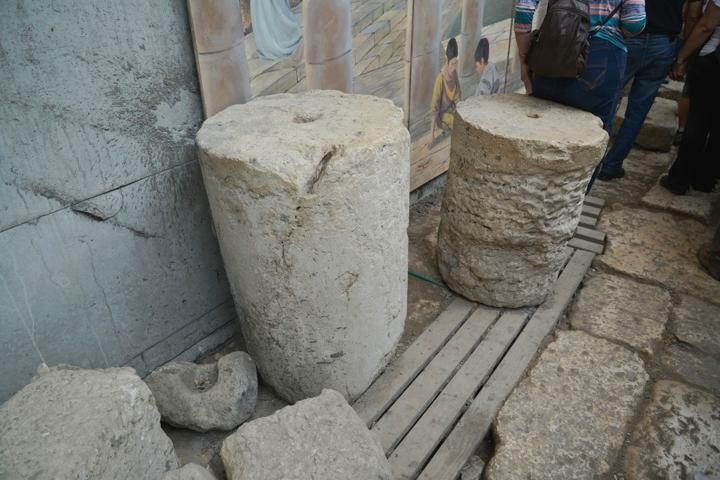 Recent excavations in the area of City of David have revealed a section of an ancient ritual pool, dated to the second temple period, east of the traditional Byzantine-period pool which was known to date. 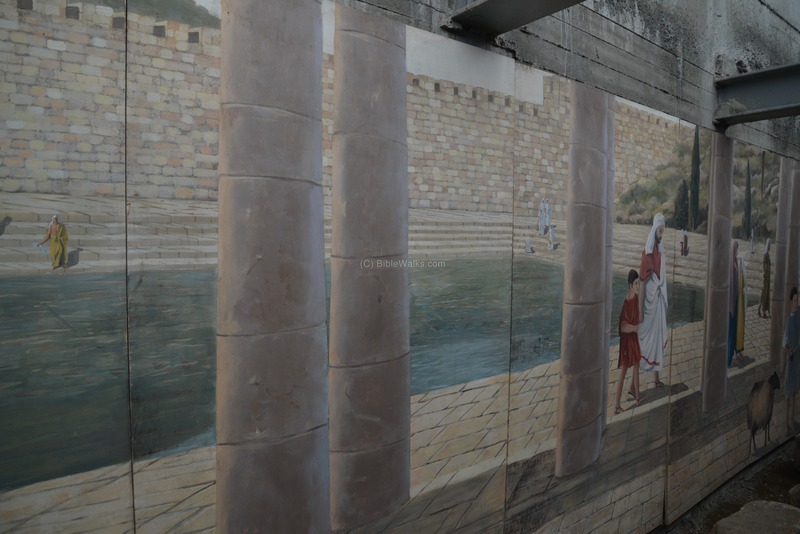 The pool supported the pilgrims to the temple, who purified themselves before ascending to the temple mount via a wide Herodian street which started from the pool. The location of the Shiloah pool, and other sites in the area of the "City of David", are shown in this aerial view. After the death of the Assyrian king Sargon II (705 B.C. ), king Hezekiah, son of King Ahaz, mutinied against the Assyrians, joining other cities in the area who attempted to free themselves from the Assyrian conquest. Anticipating the coming Assyrian intrusion, he fortified Jerusalem and the major cities. Hezekiah (King 716-687 B.C.) 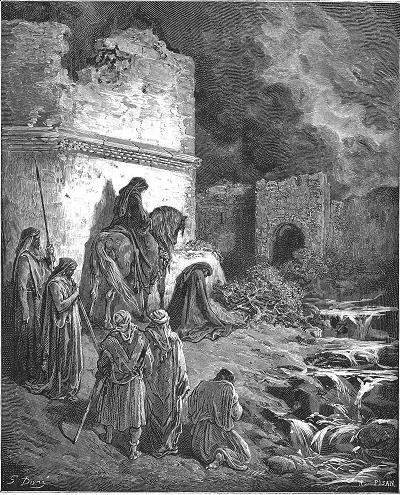 prepared Judea on the eve of the Assyrian intrusion. Among other works, he constructed a tunnel from the Gihon spring to the Shiloah (Siloam) pool, blocking the old Canaanite watercourse in order to prevent the waters of the Gihon to be used by the enemy. "And when Hezekiah saw that Sennacherib was come, and that he was purposed to fight against Jerusalem, He took counsel with his princes and his mighty men to stop the waters of the fountains which were without the city: and they did help him. So there was gathered much people together, who stopped all the fountains, and the brook that ran through the midst of the land, saying, Why should the kings of Assyria come, and find much water?". The tunnel brought the spring waters into the walls of the city of David, rather than flowing out to the Kidron (2 Chronicles 32 30): "This same Hezekiah also stopped the upper watercourse of Gihon, and brought it straight down to the west side of the city of David". The tunnel project is also summarized in Hezekiah's Biblical "obituary" (2 Kings 20 20): "And the rest of the acts of Hezekiah, and all his might, and how he made a pool, and a conduit, and brought water into the city, are they not written in the book of the chronicles of the kings of Judah?". 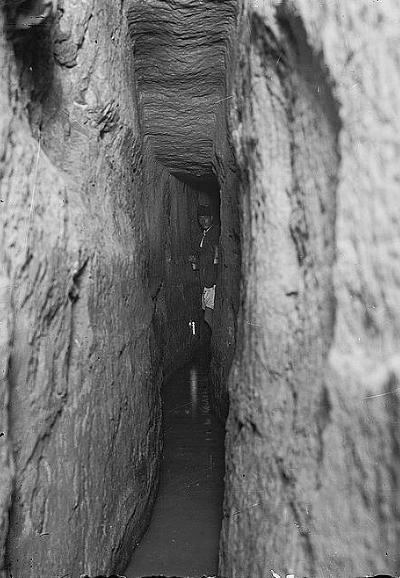 This Hezekiah tunnel ("Tunnel VIII") starts from the source - the Gihon spring. It was cut into the rock, leading the water along the eastern hill to the Shiloah pool, which was inside the fortified city. 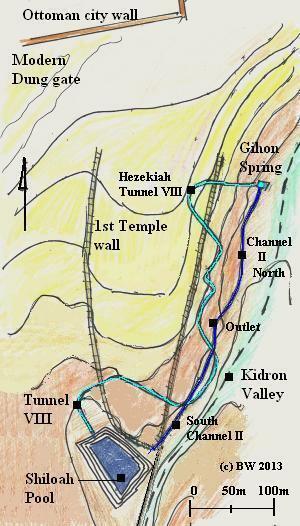 An illustration of the water tunnels south of the Gihon spring is illustrated here. Tunnel VIII winds around, underground below the city walls. It reaches the Shiloah pool from the north west side. 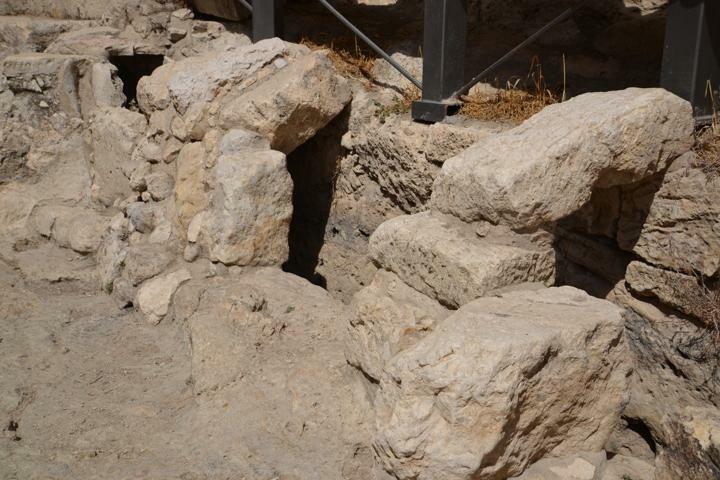 An earlier channel ("II") existed in the Canaanite period, with an outlet to the Kidron valley. It was extended southwards at the 8th Century B.C., perhaps by Hezekiah or earlier. The Hezekiah tunnel is still functioning, feeding the pool . 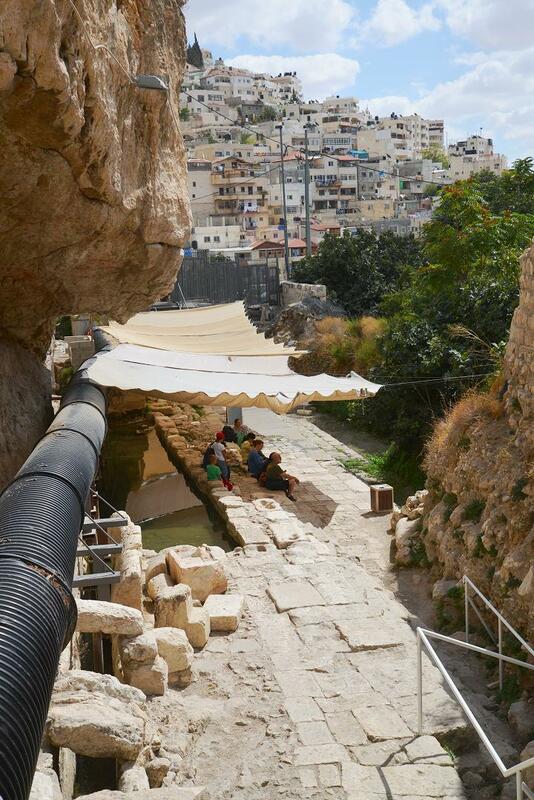 You can walk along the winding wet tunnel, 533 m long, from the Gihon spring to the Shiloah Byzantine period pool (Ain Silwan). The height difference between the source and the destination is 30 cm (0.06%). Gihon: (2 Kings 18:17): "And they went up and came to Jerusalem. And when they were come up, they came and stood by the conduit of the upper pool, which is in the highway of the fuller's field". Shiloah: (Isaiah 22:9): "Ye have seen also the breaches of the city of David, that they are many: and ye gathered together the waters of the lower pool". (Isaiah 22 9:11) "Ye made also a ditch between the two walls for the water of the old pool". The Assyrian army came in 701, leaded by Sennacherib, son of Sargon II. Jerusalem was spared this time, saved by Hezekiah's preparations and the destruction of the army by God's angels. King Manasseh, son of Hezekiah, reigned 687-643 B.C. He continued to prepare the city for the Assyrian's return (2 Chronicles 33:14): "Now after this he built a wall without the city of David, on the west side of Gihon, in the valley, even to the entering in at the fish gate, and compassed about Ophel, and raised it up a very great height, and put captains of war in all the fenced cities of Judah". The Assyrian empire fell in 610 B.C., and was replaced by the Babylonians. The Babylonians, headed by Nebuchadnezzar, conquered the coastal cities in 604 BC (2 Kings 24 7), and later destroyed Judea and Jerusalem in 587. The temple and Jerusalem were destroyed, and some of the population were exiled. The Gihon spring fortifications were destroyed, its location was forgotten, and the water came out only to the outlet of the Shiloah pool. Nehemiah's night tour around the ruined city of David are illustrated on the right, where the waters of Shiloah - named here the King's pool - are seen flowing on the right side. This is detailed in the Bible (Nehemiah 2 13-15): "And I went out by night by the gate of the valley, even before the dragon well, and to the dung port, and viewed the walls of Jerusalem, which were broken down, and the gates thereof were consumed with fire. Then I went on to the gate of the fountain, and to the king's pool: but there was no place for the beast that was under me to pass. Then went I up in the night by the brook, and viewed the wall, and turned back, and entered by the gate of the valley, and so returned". 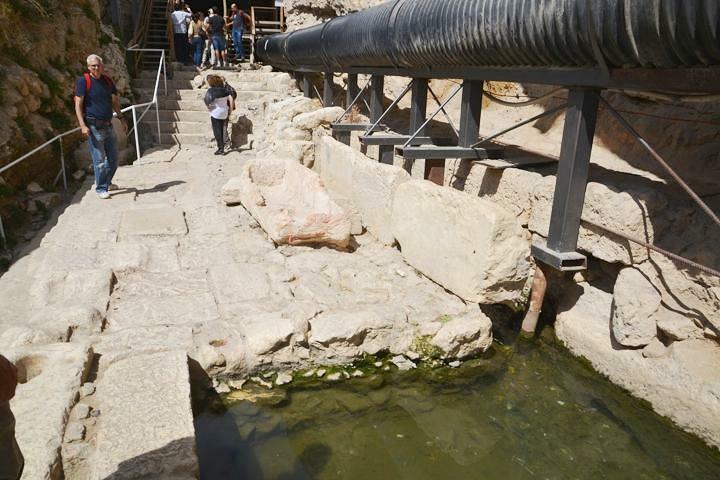 At Nehemiah's times, the original source of the water - the Gihon spring - was forgotten. 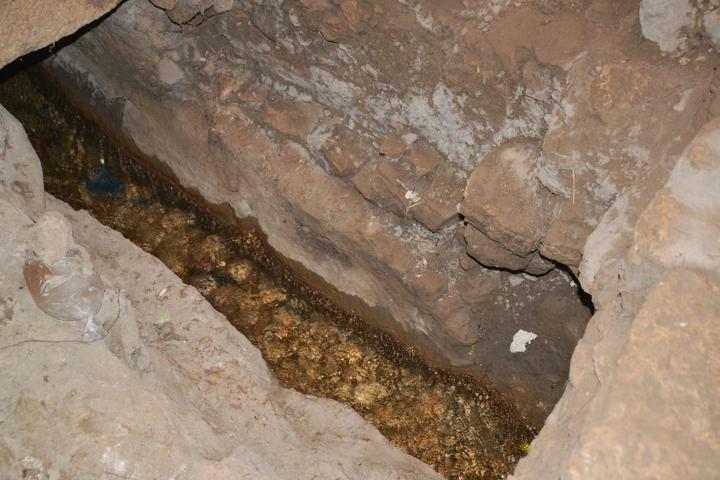 The waters of the Gihon spring were diverted to the southern outlet ("the gate of the fountain") which filled the Shiloah pool ("King's pool"). "But the gate of the fountain repaired Shallun the son of Colhozeh, the ruler of part of Mizpah; he built it, and covered it, and set up the doors thereof, the locks thereof, and the bars thereof, and the wall of the pool of Siloah by the King's garden, and unto the stairs that go down from the city of David". 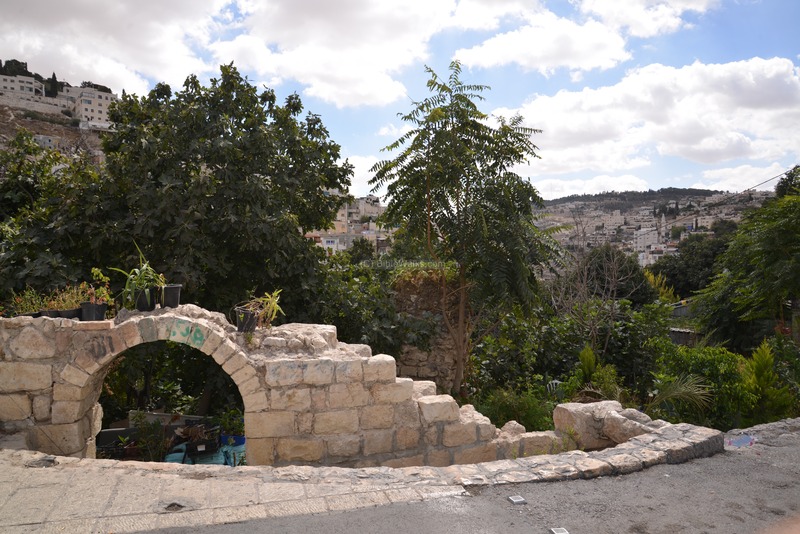 The "King's garden" was probably located near the crossing of the Kidron valley and the "Valley of the Cheese mongers" (Tyropoeon Valley) which descends from the west side of the temple. 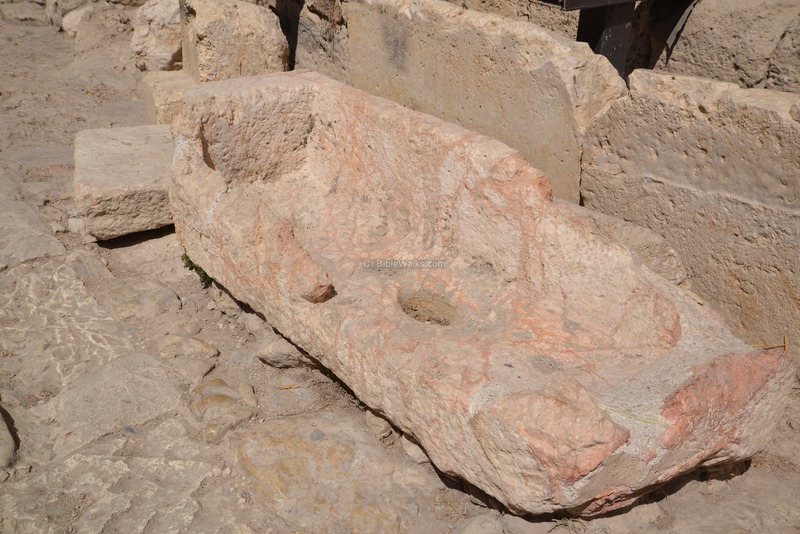 Evidence of an earlier pool, dated to the late Hasmonean period or the early Herodian period, was found during the excavation of the newly discovered second temple period Shiloah pool. 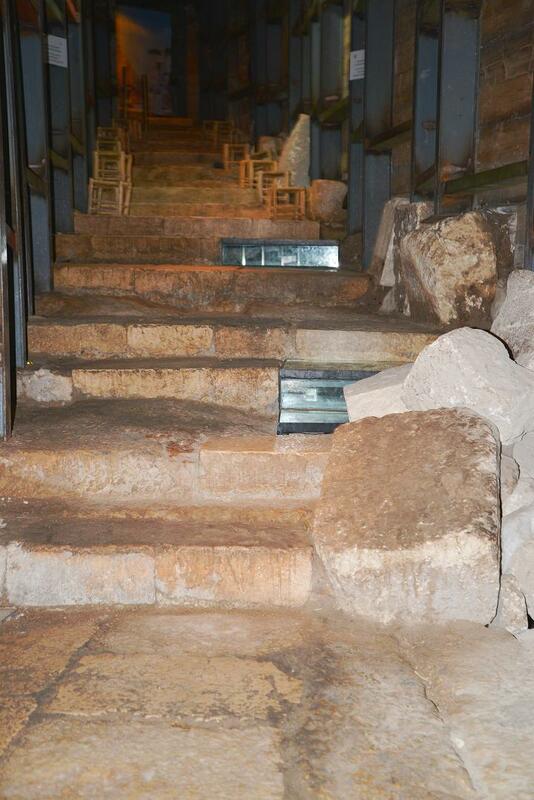 Under the pavement and steps of the Herodian period was a lower layer of plaster. Herod the Great, King of Israel under the Romans (37BC - 4BC), enlarged and rebuilt the second temple, and made it a magnificent temple. Herod reshaped the city, constructing public houses, streets, bridges, tunnels, and fortifications. An illustration of Jerusalem at the end of the 1st Century B.C. and the beginning of the 1st Century A.D., is shown here with the city's major points of interest. The distance from the south side of the temple to the southern edge of the city is 720 m. The Shiloah pool is close to the southern edge of the lower city, near the Essenes gate. Herod constructed the Shiloah pool, where the pilgrims would purify themselves. A wide stepped road ascended from the pool to the south side of the temple, passing between residential houses and shops on both sides of the road. 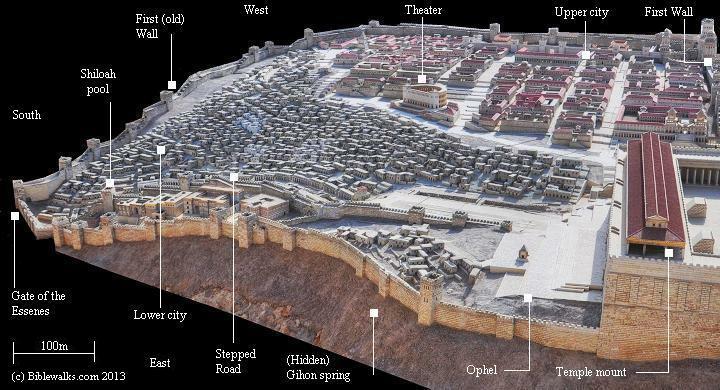 A model of the Herodian city is shown here, focusing on the south side. "Now the Valley of the Cheesemongers, as it was called, and was that which we told you before distinguished the hill of the upper city from that of the lower, extended as far as Siloam; for that is the name of a fountain which hath sweet water in it, and this in great plenty also. But on the outsides, these hills are surrounded by deep valleys, and by reason of the precipices to them belonging on both sides they are every where unpassable". He describes the south side (Wars 5:4:2): "...But if we go the other way westward, it began at the same place, and extended through a place called "Bethso," to the gate of the Essens; and after that it went southward, having its bending above the fountain Siloam, where it also bends again towards the east at Solomon's pool, and reaches as far as a certain place which they called "Ophlas," where it was joined to the eastern cloister of the temple". The Shiloah pool is mentioned by Jesus as an example of a tragic story, while comparing it to the sudden death of Galileans (Luke 13:2-4): "And Jesus answering said unto them, Suppose ye that these Galilaeans were sinners above all the Galilaeans, because they suffered such things? I tell you, Nay: but, except ye repent, ye shall all likewise perish. Or those eighteen, upon whom the tower in Siloam fell, and slew them, think ye that they were sinners above all men that dwelt in Jerusalem?". Jesus also heals the blind man in the Holy waters of the pool (John 9 11 ): "He answered and said, A man that is called Jesus made clay, and anointed mine eyes, and said unto me, Go to the pool of Siloam, and wash: and I went and washed, and I received sight". Following the Great Revolt, the Romans destroyed Jerusalem in 70 A.D., razing the temple and the City of David. 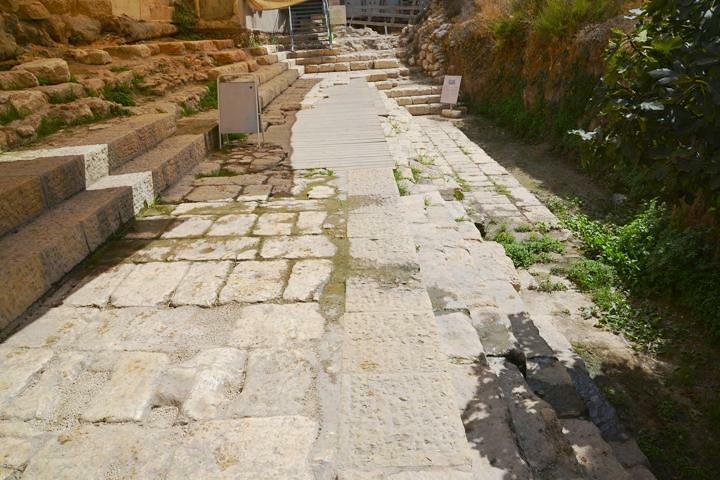 They destroyed the Shiloah pool and the Herodian street that ascended from it. The pool was buried by silt that accumulated over almost 2,000 years to heights of up to 4m. After the destruction of Jerusalem, the Jewish population revolted again 60 years later, headed by Bar-Kochba. A major cause of this revolt was the plans of the Roman emperor, Hadrian, to build Jerusalem as the Pagan city of Aelia Capitolina. After the Romans subdued the revolt (years 131-135), the city was rebuilt as a Roman city. During the 5th Century, a Byzantine Church was built at the side of the new site of the Siloam pool, located closer to the edge of the tunnel. The pool was incorporated into the Church complex. The Church, commemorating the miracle of the healing of the blind man, was probably established by Empress Aelia Eudocia Augusta (401-460AD), wife of the East Roman Emperor Theodosius II, who visited the Holy Land (438-439, 450-460) and constructed other monasteries. The Church was leveled in the Middle ages, replaced by a mosque which stands over its ruins. 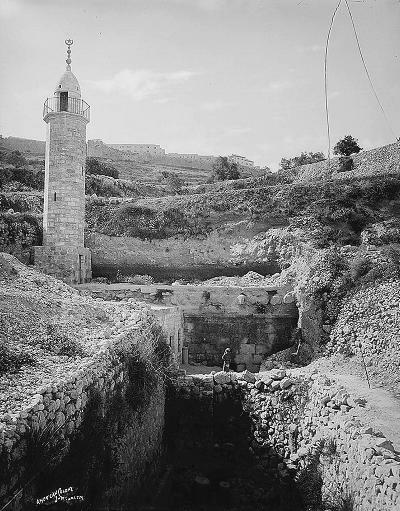 It minaret tower is seen here on the late 19th Century photo, northwest of the remains of the Byzantine pool. Remains of the church were found under the mosque.
" 'Ain Silwan lies at the junction of the middle valley, El-Wad [BW: Hinnom], with Wady Sitti Maryam [BW: Kidron]. In spite of its name, it is not a true spring, since it is fed by the tunnel from the Virgin's Fountain [BW: Gihon spring]. south, by 18 feet east and west, and having its bottom at a level 2,086 feet above the Mediterranean. The average depth is 20 feet, and on the north an archway 5 feet wide appears, leading to a small vault 12 feet long, in which is a descent from the level of the top of the pool to the level of the channel supplying it. This vault is modern, and the old mouth of the rock-cut channel has been stopped up on the east side of the present pool, the water now being admitted farther west under the vault. The recent explorations of Dr. Guthe prove that the pool was originally much larger and cut in rock. On the east it probably extended to the present rocky scarp, in which a channel is now cut connecting with the lower pool, formed by a strong masonry dam at the mouth of the Tyropoeon where it opens into the Kidron valley. The date of the masonry of this dam, which is about a hundred yards southeast of the pool, is unknown; but it is extremely massive, and probably of great antiquity". "The lower pool is now known as Birket el-Hamra, "the Red Pool." It has lately been fenced with a high wall for use as a garden, and the water of the upper pool no longer flows into it.". The author of the book did not know that 100 years later the ancient Herodian pool will be found under the mud of the "Red pool". 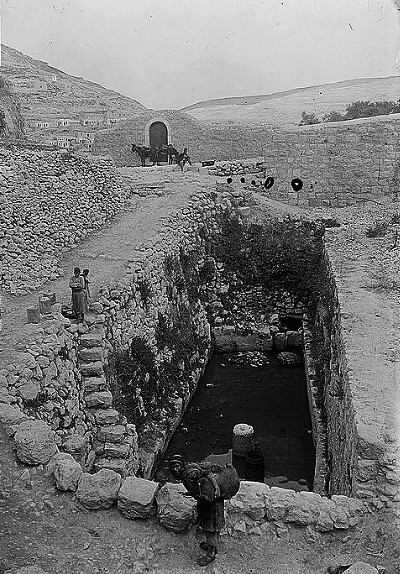 The location of the old pool of Shiloah was forgotten, and the scholars assumed that it was buried under the Byzantine pool, at the outlet of the tunnel. For 2000 years the ancient pool was hidden under the ground. 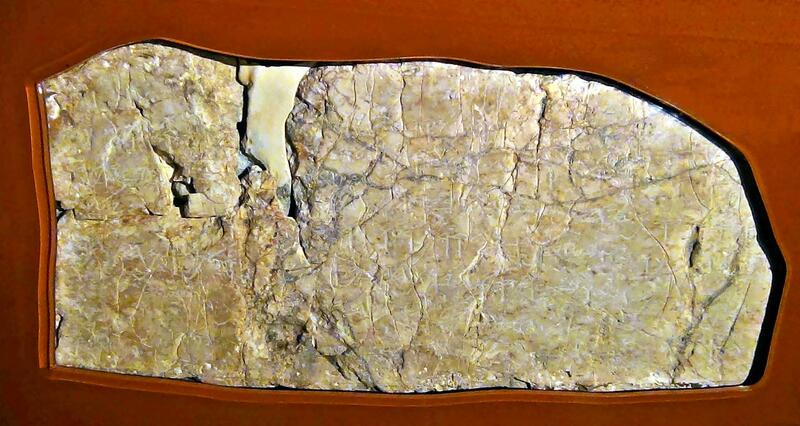 However, as it happens in many important archaeological discoveries, it was found by chance. 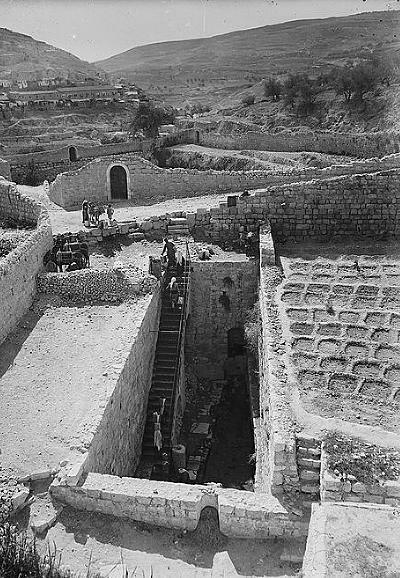 The archaeologist Eli Shukron was watching a team of workers trying to repair a drainage pipeline near the south side of the ridge of the City of David, east of the Byzantine Shiloah pool. Their tractor hit some of the slabs, and the archeologist stopped the work and summoned his colleague Ronny Reich. They continued to peal off more of the soil and revealed a section of the steps of an ancient pool, dated to the second temple period. After extensive cleaning followed by conservation operations, the full extent of the northern section of the pool was revealed. Although most of the pool is still covered due to digging restrictions in the area, the plan and approximate dating of the pool is known. The archaeologists also found evidence of an earlier pool dated to the late Hasmonean period, which was an earlier phase of the construction. The area east of the pools is part of the village of Siloam. The neighborhood, "Al-Bustan", is located near the crossing of the Kidron valley and the "Valley of the Cheese mongers" (Tyropoeon Valley). The word Bustan means "fruit garden" in both Arabic and Hebrew, and owes its existence to the waters of Shiloah (Siloam). 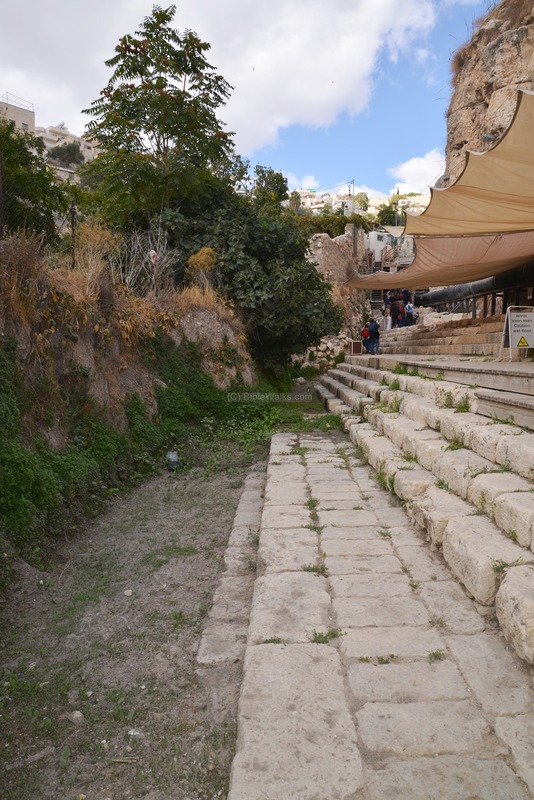 This may have been the location of the Biblical "Kings garden". The ancient pool was discovered on the lower east side of the Byzantine pool. A team of workers were digging to repair the drainage pipe, and struck a section of the pool. 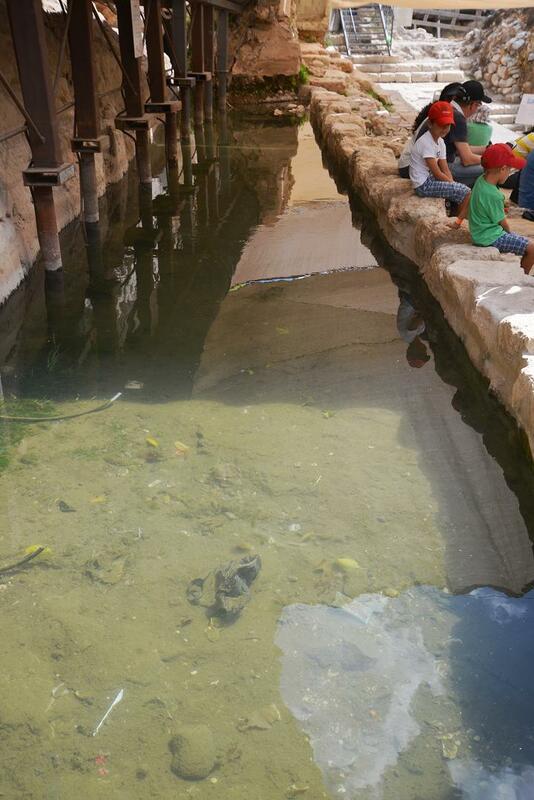 This photo shows the current [October 2013) status of the excavated pool. A black pipe was laid over the edge of the site as a temporary bypass. The pool covers the entire area of the modern garden, at an estimated size of 3 Dunams (3/4 of an Acre). The majority of the pool is still covered by a garden, which is a property of the Greek Orthodox church. After the destruction of the city (70 A.D.) the pool ceased to function, was filled with earth and disappeared from sight until 2004 when it was rediscovered. The Shiloah pool has a near rectangular design, with steps built around its peripheral. There are three sets of 5 steps each. Between the two upper sets is a landing area, while the lower set reaches the level of the bottom of the pool. This design accommodated different water levels. The pool design allowed the tens of thousands of pilgrims to step down into the pool, dip into its Holy waters, purify themselves, wrap in new clothes, then walk up to the temple mount. Although dozens of baptismal facilities exist around the walls of the temple, those facilities could not cleanse the vast amount of pilgrims during the three major holidays. On the side of the pool is a section of the water channel. Behind it, on the unseen face of the cliff, was an outlet of the southern Shiloah channel (channel "II") that brought the waters from the Gihon spring to another pool, located inside the walls of the first temple period city. The archaeological excavations yielded additional findings. One of the interesting artifacts found in the drainage canal excavation, on the north side of the pool, was a tiny golden bell which may have been part of the robes of a high priest. Another finding included an engraved Menorah. Eli Shukron tells about his discovery of the pool and Herodian street, and findings during the excavation. You can listen to his story in Hebrew, recorded live and uncut, for 9:02 minutes, by clicking here. The archaeologists continued to dig to the north of the pool, and revealed a section of the adjacent plaza, Herodian street and central drainage channel. A section west of the pool was unearthed, where a colonnaded promenade was standing, giving shelter to the pilgrims . This photo is viewed from the south side of the wide plaza, where the Herodian street starts to climb up to the temple. A painting along the wall illustrates how the pool would have seen in ancient times from this covered plaza. Several sections of the columns were discovered at the site. 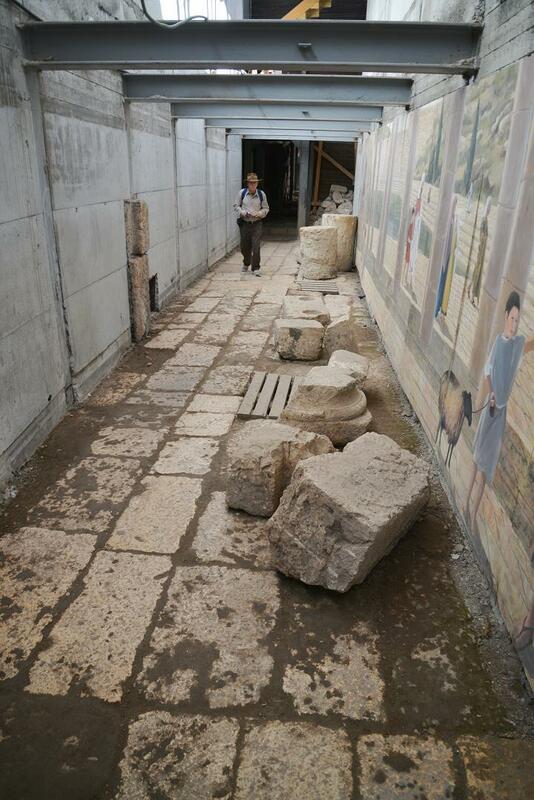 Archaeological excavations revealed two sides of a wide Herodian street. The wide, uncovered, Herodian street connected the pool area to temple mount. The pilgrims walked up these stairs to the south side of the temple. The lower section is 30m (!) wide, then narrows down to 8m. The illustration shows the southern edge of the Roman city. The Shiloah pool was located near the gate of the Essenes, and the stepped road ascended from the pool's plaza up the hill, between the houses of the lower city. It reached the southern side of the temple mount, where the pilgrims would enter through the Hulda gates, or from monumental staircases on the sides of the temple. 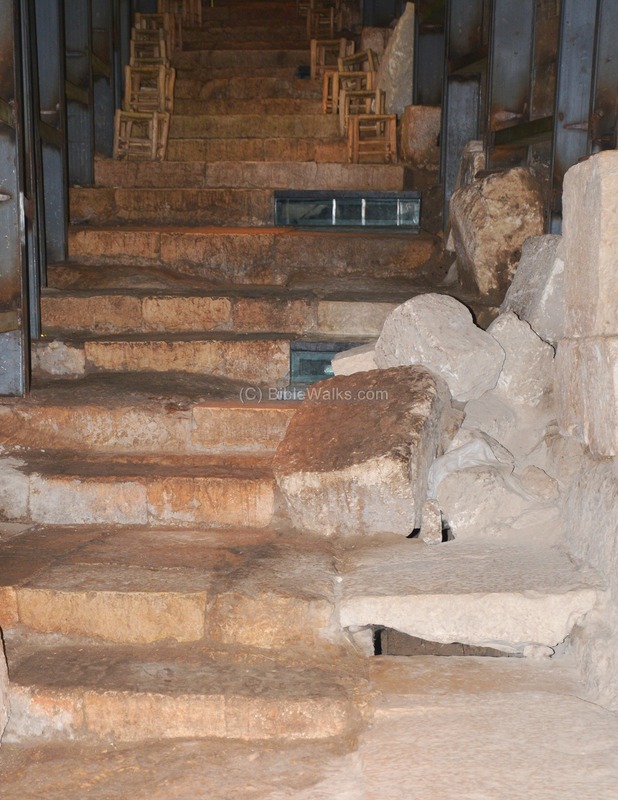 The steps of the Herodian street are in similar design as in the Hulda gates to the temple, where the staircase consists of pairs of alternating broad (90cm) and narrow (30cm) steps. They were arranged in a pattern of broad-narrow step, probably intentionally in order to force the climbing visitor to the temple to look down in order to follow the steps - thus seeming to bow to the holiness of the great temple. The photo below shows the eastern section of this stepped Herodian street. 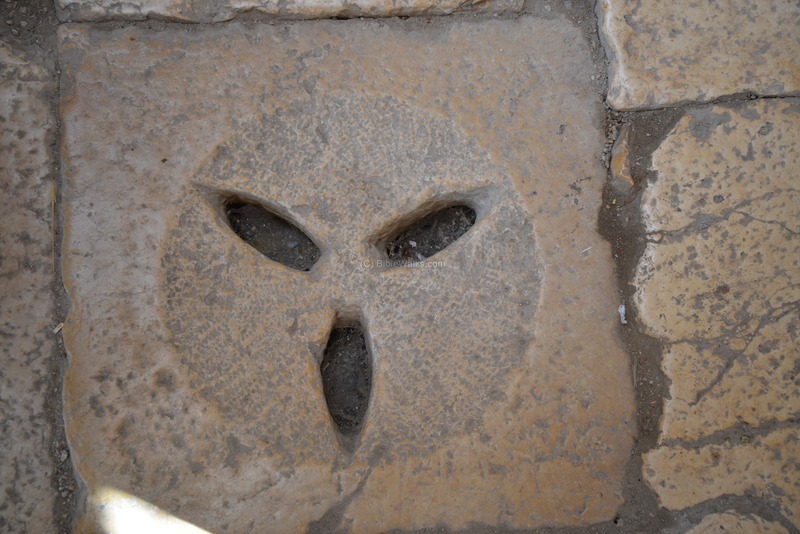 A drainage channel, also dated to Herod's period, was found under the paving stones on this side. It was constructed under the street in order to collect the runoff rain water. The underground channel also served as a hiding place for the remaining Jewish rebels during the last days of the destruction of Jerusalem in 70 A.D. Holes punctured into the pavements (as seen on the right side of the steps) are visible signs of the attempts of the Legionnaires to locate the rebels and their families hiding under the paved street. A Roman sword and its leather scabbard was found inside the channel, an evidence of the Roman search. Josephus wrote about this tragic hide and seek (Wars 6, 9:4): "Romans slew some of them, some they carried captives, and others they made a search for under ground, and when they found where they were, they broke up the ground and slew all they met with". His account of the desperate struggle of the Jews, following the destruction of the city, really comes alive here. You can read more about the drainage channel in a separate web page. Eli Shukron tells about his discovery of the Herodian street and the drainage channel under it. He first dug into the drainage channel, looking for channels that led into the pool. While looking up to the ceiling, he noticed the bottom of the paving stones of the stepped road. 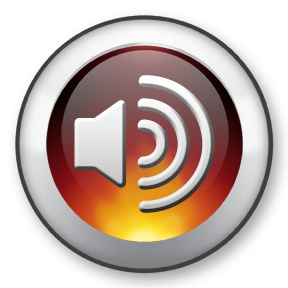 You can listen to his story in Hebrew, recorded live and uncut, for 3:04 minutes, by clicking here. Siloam - New Testament name of Shiloah (John 9, 7): "And said unto him, Go, wash in the pool of Siloam, (which is by interpretation, Sent.) He went his way therefore, and washed, and came seeing". (Asher Grosberg; pdf, 56 pages, Hebrew; 2012) - recommended!